April 2001, Kings Cross Station, London. 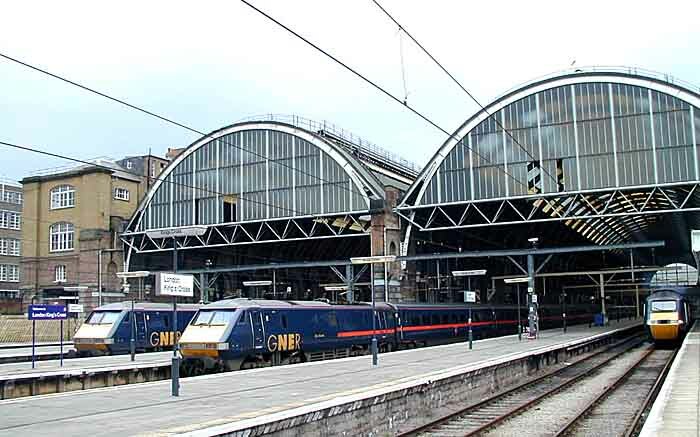 Here we see a timeless British railway scene: sets of Great North Eastern Railway trains ready to depart England's busiest intercity station to Edinbrugh, York, Newcastle, Glasgow, and many other northern cities. GNER's speedy trains traverse some of the most beautiful British scenery and many carry splendid restaurant cars featuring regional cuisine (the last full restaurant cars in the UK) and other amenities, including wireless services for computer users. Walk along this platform and a few yards further you will enter the Kings Cross Underground station, near which a horrific July 7 bomb exploded on the Picadilly Line. We want to salute the marvelous response of railway and public emergency and police personnel who risked their lives for innocent civilians trapped far below -- and in other venues where the cowardly terrorists struck. As one who frequents the trains and neighborhoods where several explosions took place we feel particularly close to events. From all Friends of Amtrak, a hearty salute and full condolences and sympathy to British and other victims of Europe's second rail attack. We hope the example set by our British friends is a good example in fearful times. Acela days are here again, and a picture speaks a thousand words about this happy turn of events! 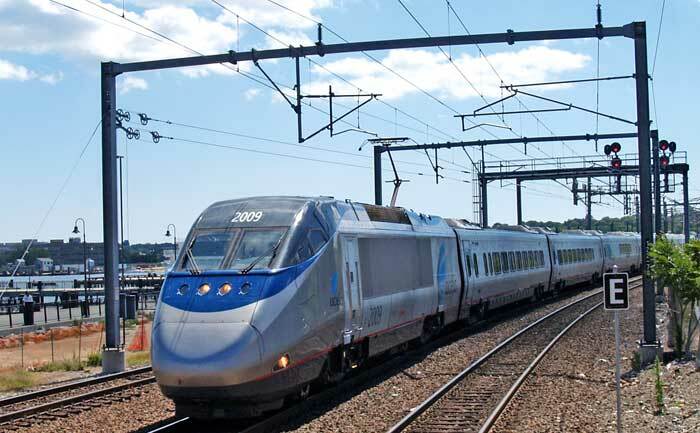 Here's Train #2250, the first repaired Acela Express on the New York to Boston line, cruising through New London on its way to Boston from Washington at 2:17pm on Saturday, July 23, 2005. Amtrak has beaten off the slashers in the Bush administration, led by Secretary of Transportation Mineta, with only his vague threats of a very unlikely transportation budget veto and some rather crude attempts by Administration bean counters to get at the national system by cutting sleeping car and food services remaining to be resolved. By all accounts Amtrak did a fine job accomodating customers while the Acelas were out of service, and CEO David Gunn has kept a firm hand on the tiller. As Congress, and even terrorists know, 'It's Infrastructure Stupid'. 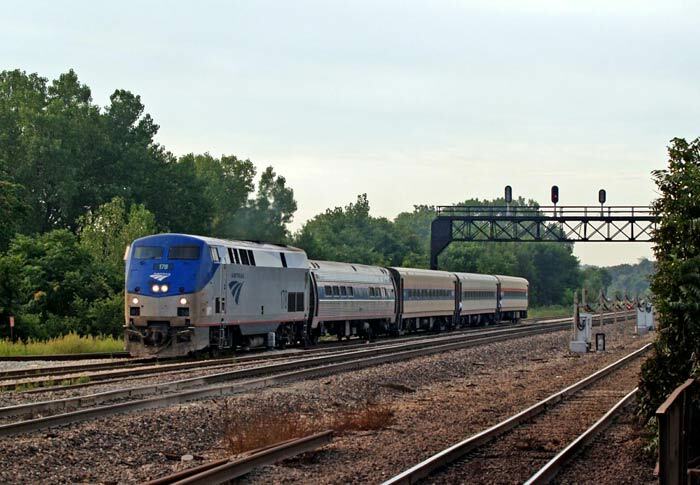 Here's Amtrak's State House arriving in Joliet, Illinois, on its way from St. Louis to Chicago in late August, 2005. If there's a better place to enjoy railroading in the United States than Joliet I'll eat my camera case. A gracious old station, beautifully maintained rail artwork celebrating Joliet's railway history, easy parking, two METRA lines to Chicago, Amtrak's St. Louis line, with one train going on to Kansas City, and the Texas Eagle, all make for wonderful viewing. Hang around a place like this and you'll see railroading at its best, and reasons for increased support for passenger rail. Changes last made on: October 17, 2005.